Catahoula Leopard Dogs - The Catahoula Leopard Dog is a medium sized dog, also known as the Lousianna Catahoula Leopard Dog, Catahoula Cur, Catahoula Hog Dog, or simply the Catahoula Hound, is named after Catahoula Parish, Louisiana. Of remaining dog breeds, the Catahoula is believed to have occupied North America the longest, aside from the dogs descended from Native American-created breeds. As a working dog, Catahoulas have been bred more for temperament and ability than for appearance. As a result, the physical characteristics of the Catahoula are somewhat varied. The Catahoula Leopard Dog has been recorded in the Foundation Stock Service since 1996 under the herding classification. 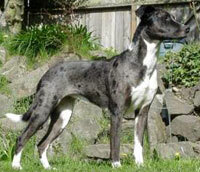 Catahoulas are highly intelligent, energetic, and quick, yet are generally very loving and gentle with children. They are inquisitive and have an independent streak. However, the Catahoula temperament is not suited for everyone as they tend to be very protective of their territory and family, and may be aggressive toward other dogs. The Catahoula Leopard Dog may not be appropriate for inexperienced or meek owners. Ideally, a Catahoula should have proper obedience training, secure confinement on the owner's property, and an outlet for its energy. This information is licensed under the GNU Free Documentation License. It uses some material from the Catahoula Leopard Dog article on Wikipedia.org. 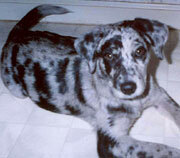 Catahoula Leopard Dog Breeders - Advertise your kennel puppies and dogs here.